SAN FRANCISCO, CA, November 30, 2017 /24-7PressRelease/ — Dr. Panda LLC, one of the world’s leading kids’ app developers, expands on its augmented reality (AR) technology, launching a holiday AR app on iOS, Dr. Panda AR Christmas Tree. This new app, using Apple’s ARKit, provides a fun augmented reality experience counting down the days to Christmas with a virtual Christmas tree that people can interact with and decorate however they like. Dr. Panda AR Christmas Tree redefines the magic of Christmas by creating an immersive experience using AR technology. 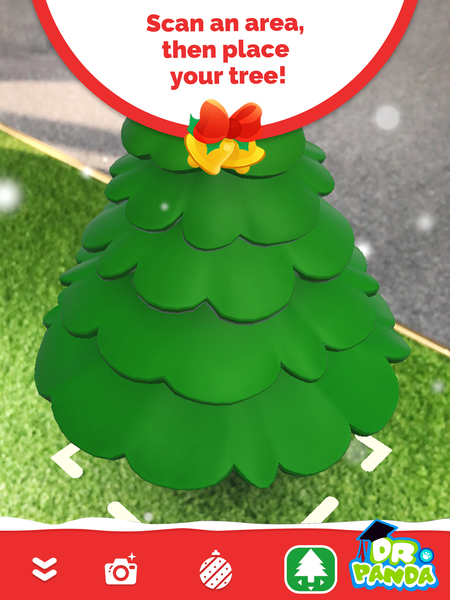 Use an iPhone or iPad, find the perfect spot to place the 360-degree virtual tree and see it appear in the physical space. Each day leading up to the 25th, serving as a countdown to Christmas, a new ornament will be revealed to decorate your tree. Dr. Panda AR Christmas Tree allows users to adjust the size of their tree, create their own unique tree with a total of 27 different ornaments, and offers the capability to share their creation and holiday spirit with friends and family. This AR app is fun for the whole family, from kids ages 3 and up and even for adults. Dr. Panda AR Christmas Tree is available as of today on the App Store and is compatible with iPhone 6s and up, or latest generation iPad, running iOS 11.